Create public consensus that this special place is worthy of protection for its exceptional ecological, cultural, scenic, and recreational resources. Identify and respond to regional threats to environmental, historical, and scenic resources. Advocate for public policies and conservation projects that protect or steward our region’s natural, historical, and scenic resources. 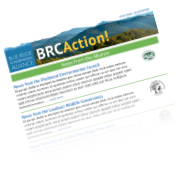 Improve communication and collaboration among conservation organizations across the BRCA’s six counties in Virginia and West Virginia. Protect Water Quality and Supply. The Blue Ridge Mountains between Shenandoah National Park and the Potomac River are in the Potomac River watershed, the drinking water supply for Washington, DC many other communities. Protecting the Blue Ridge as a largely forested and undeveloped landscape will in turn protect the region’s water quality and quantity. Protect the Blue Ridge’s Natural Heritage. Encroaching development, regional infrastructure projects, non-native invasive species and a host of other forces threaten the ecological integrity of the Blue Ridge Mountains’ forests and streams — and its native plants and animals. Preserve the Blue Ridge’s Cultural Heritage. The BRCA Focus Area encompasses a landscape that is blessed with a rich cultural history. From nationally recognized historic sites such Harpers Ferry to the less well known, the area’s landscape tells many stories of human exploration and settlement during times of both peace and war. Preservation of this cultural landscape contributes to a better understanding the political, economic and geographic forces that shaped not just the region, but the nation. Preserve the Scenic Beauty of the Blue Ridge. The mountains give us spectacular panoramic views of mountains and valleys, fields and forest, rivers and streams. These vistas connect the natural beauty of the mountains with the surrounding historic and scenic countryside. Maintaining the integrity this landscape is essential to maintaining the scenic beauty that has inspired visitors and residents for generations.